Well, we guess the reason you are here is to find the best air purifiers for allergies and asthma. You (or your family) may be suffering from very bad allergies or asthma, right? We make this list after testing 120+ air purifiers to ensure that this list is the most proper buying guide of air purifiers for allergies and asthma in 2019. We’ve spent hours whittling the contenders down to a top 10, and we take into account the performance, power, features, a bit of design, and most importantly, value for money of each air purifier device. We do give honest reviews (both pros and cons) and a base comparison for all the air purifiers so anyone will guarantee to have the wisest choices. We do not (and we never) exaggerate one product just to let you click the links and buy that product blindly. Air purifiers are for everyone. Believing that, we will give you the best air purifiers from low-range to high-range. To know the exact price of your air purifier, make sure to hit the Check price button. The list of best air purifiers for allergies and asthma is updated regularly. We need at least 2 weeks of continuous running to guarantee the best performance of one air purifier. If one new air purifier is released, we will keep updating our list. You will never find an outdated air purifier here. UPDATED: We have updated our list of best air purifiers for allergies and asthma in 03/01/2019. In Breathe Quality, we keep updating our posts whenever possible, and this update is the result of a 3-month consecutive experiment in our labs, so we can make sure that you will get the right air purifier for your allergies and asthma. Our next update will be set for 3-6 months later, depending on the release of new products from the well-known air purifier brands. However, you don’t need to wait, because the air purifier market will never change so quickly. Before you get straight into our list, we must ensure that you know how to define a best air purifier for allergies and asthma in 2019. Must have True HEPA Filter for removing even the smallest of bacteria, virus and other pollutant particles and an Activated Carbon filter to help with smoke and odors. Ionizer filter shouldn’t be included to help preventing asthma attack, or can be switched on/off. To understand the air filter types and how they work, please read this article. The noise must be at low level, or completely no sound for not triggering asthma related to sound. The fan power of your air purifier, because the higher fan power the faster cleaning of your air purifier. You could quickly check the fan power through the ACH and CADR ratings. Keep all these three above rules in your mind whenever you purchase an air purifier for allergies and asthma. We wish nothing but your healthy life. Time to find out the best air purifiers for allergies and asthma in 2019! This Comparison Table of best air purifiers for allergies and asthma will help you have a quick overview of our list of Top 10 Best Air Purifiers for Allergies and Asthma in 2019. The factor for comparison in this table is the Filter Types of this air purifier (which are always including of True HEPA filter). We also give the most concerned factors as the Room Coverage or the Air Purifier’s Size. Remember that you should check the reviews of this comparison table. We will share all the knowledge about the pros and cons of each air purifier. To understand more clearly why we use this list of best air purifier for allergies and asthma in 2019, you should scroll to our buying guide. Previously in our list: Rabbit Air MinusA2. There’s been a load of stunning best air purifiers for allergies and asthma in 2019, yet the Rabbit Air MinusA2 is certainly the one with the most features. It is not the expensive air purifier on the market, but for both the performance and the value, it can beat every other device on the market without doubt. For the performance, this Rabbit Air MinusA2 packs an unique 6-stage air filtration system to guarantee the best protection against allergies and asthma. Pre-filter & Medium Filter – Double the pre-filtration means double the effectiveness against allergens. These 2-layer filters will guarantee to trap all large and medium particles, for example dust mites, pet hair, large pollen, pet dander, mold and dust particles. Advanced BioGS HEPA Filter – It is a True HEPA Filter that captures 99.97% of all allergens, bacteria, virus particles, pollen, mold and fungi particles down to 0.3 microns. Rabbit Air advances their air filter process, therefore prolong optimal filter efficiency and filter life of their HEPA Filter. Customized Filter – Double the protection with a variety of customized filters for specific needs like Germ Defense, Pet Allergy, Odor Remover, or Toxin Absorber. You can tailor the MinusA2 air purifier to fit your personal needs. Activated Carbon Filter – Eliminates household and cooking odors, tobacco smokes and exhaust fumes and VOCs. Ion Generator – Rabbit Air MinusA2 still has ionizer technology to trap even the tiniest particles of pollutant back into other filters. Can be switched on/off. Expert tips: The amount of ozone is about 0.002 ppm, which is 25 times less than the 0.05 ppm maximum ozone safety standard set by California Air Resource Board – the authorized air cleaning agency in the government of California. When you look for an air purifier to solve your health problems (allergies and asthma), you must both look at the quantity and the quality of this device’s air filters. Normally, the more filters the more stages to remove the airborne allergens. An air purifier commonly has 3 or 4 stages of air cleaning system, while the Rabbit Air MinusA2 develops to 6 stages, with 5 mechanical layers of air filters. About the air filters, they are of the excellent quality we’ve come to expect from Rabbit Air. Beside the normal pre-filter, Rabbit Air MinusA2 is installed with one additional medium filter (which is a HEPA-type filter) to eliminate as much airborne contaminants as possible. Even if these impurities can pass the double pre-filter, it won’t escape the high-quality True HEPA filter of Rabbit Air MinusA2. The high efficiency of 99.97% for down to 0.3 microns particles is the best that is recorded right now. And it can last for 12 to 18 months more than the common True HEPA filters, thanks to the necessary support of these double pre-filters. The Charcoal-Based Activated Carbon Filter from Rabbit Air MinusA2 is made of high-grade granular activated carbon, which is better than the most typical thin layer of activated carbon. Chemicals, smoke and common household odors can be effectively reduced. If you have serious allergies by your pets or cigarette and cigar smoke, you should select the Pet Allergy or Odor Remover Customized Filter, so it can support your Rabbit Air MinusA2’s carbon filter. With up to double filtration against all types of chemicals, smoke, smell and odors, Rabbit Air MinusA2 makes sure to end the allergies and asthma symptoms from you. Another unique selling point of this Rabbit Air MinusA2 is the Ultra Quiet operation. Powered by an advanced fan, the noise level of this air purifier is even lower than the kind of whisper, and in real-world use, you will not notice any sound at all. While the smart features in high-end air purifiers don’t help solve your allergies and asthma, we are still happy to use our air purifier easier. The Smart Sensor in Rabbit Air MinusA2 works fantastically well, which accurately detects the change in your indoor air quality to automatically adjust the fan speed. With this feature, you can expect to just turn on your Rabbit Air MinusA2 and forget it, as this air purifier will do everything for you. The Wifi Smart App is useful, too. There is only one downside, with such low CADR rating as 200 Dust/ 193 Smoke/ 208 Pollen (cfm), the Rabbit Air MinusA2 might take more time to clean your room completely. Especially for a room of 815 sq ft, this air purifier can only exchange the air once in 30 minutes, so you need to wait at least one hour for air cleaning progress. But overall, the Rabbit Air MinusA2 is by far the most complete on the market – you won’t regret your choice if you pick up this air purifier. Review: Rabbit Air MinusA2 Review. Previously in our list: GermGuardian AC4300BPTCA. Some viruses and bacteria in pet dander or the pollen is the most often cause of the allergies. We wonder what is your reaction if you know you can find a great solution for these viruses and bacteria with only $100 budget. The GermGuardian AC4300BPTCA is this solution for your allergies. True HEPA Filter – Claims to capture 99.9% of microscopic allergens, dust and mold spores down to 0.3 microns in size. Activated Carbon Filter – Reduces odors created from smoke, cooking, and pets. UV-C Light – The powerful technology to kill airborne bacteria, viruses and mold spores that cause health issues, but is harmless to human. The air filter may not run like a high-end air purifier, but it is still a certified True HEPA filter. For the size, this True HEPA filter is not cheap, and the performance of the GermGuardian AC4300BPTCA deserves the class-leader at the budget end of the air purifier market. 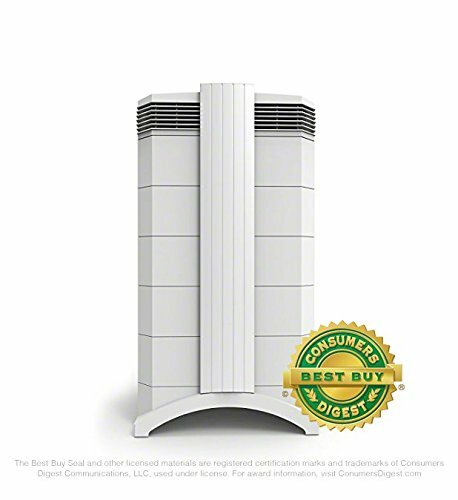 But for just a normal True HEPA filter, we won’t consider the GermGuardian AC4300BPTCA to be the best budget air purifier for allergies and asthma. There are many of candidates out there having great True HEPA filter like the Levoit LV-H132, Honeywell HPA060 or the AeraMax 100. Yes, the only thing that this GermGuardian AC4300BPTCA is better than most of the competitors is the signature UV-C light filter. This light bulb is totally harmless to human, it can disrupt the core DNA of the germs and viruses, and destroy them totally. The process is inside the air purifier, and there is no way it can affect you. Our only real disappointment is its noise level. For a budget device, it seems the company is trading off the fan power for the quality of air filters. We can’t ignore the crackling noise when running this GermGuardian AC4300BPTCA on highest fan speed. Also, the fan power is just only proper for what you pay, with a decent CADR rating of 107 Dust/ 99 Smoke/ 116 Pollen (cfm). So to say, this air purifier is only suitable for a room of 150 sq ft. Guardian Technologies is a well-known American brand for the solution of air purification. They provide the signature combination of UV-C light and True HEPA filters, for a reasonable price. If you prefer the classic model, you can look for the GermGuardian AC4825 and/or the GermGuardian AC5250PT – which are the Amazon’s Choice for many years. Or if you can afford better, you can have most of the high-end features packing in this GermGuardian CDAP4500BCA. 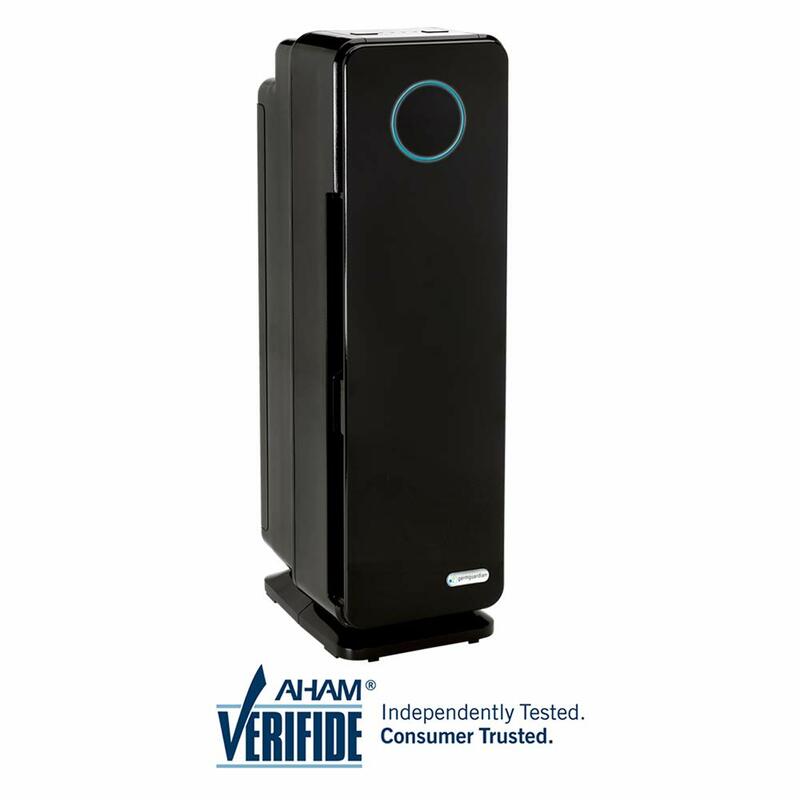 We also believe the flagship of this company – the GermGuardian AC9200WCA is a good alternative to your air purifier for allergies and asthma. Sadly, for a list of top 10 only, there are many better candidates to compete against this mid-range air purifier. Related post: Best air purifiers for mold. Previously in our list: Honeywell HPA300. As the name implies, Honeywell HPA300 is a true Allergen Remover with the highest performance rating among the low-range air purifiers. That’s why in the list of the best air purifiers for allergies and asthma, this Honeywell HPA300 is an excellent contender. Pre-filter – The pre-filter has Activated Carbon filter in it. With this, every issue of allergies and smoke asthma of you won’t linger anymore. However, you need to replace this pre-filter after 3 months. True HEPA filter – The powerful True HEPA filter can capture up to 99.97% of as small as 0.3 microns pollutant particles like pet dander, mold, bacteria and pollen. This Allergen Remover can even capture the 0.005 microns viruses. What is the successful formula for an air purifier in low-range? 40% of the popular brands will trade off the fan power, while the rest 59% choose to trim down the quality of the air filters, or using an additional of cheap UV-C light filter or ionic filter. But the last 1%? It will have both the high fan power and one of the most impressive True HEPA filters in the world. Too good to be true? That’s why you need to know about the Honeywell HPA300. Its certified True HEPA filter is undoubtedly impressive with high efficiency of capturing 99.97% of as small as 0.3 microns allergens, even some viruses down to 0.005 microns can not escape it as well. With an amazing CADR rating of 320 Dust/300 Smoke/300 Pollen (cfm) and 5X ACH, this air purifier will clean your room in a matter of minutes. This fan power is on par with even mid-range budget devices, like the Blueair Classic 405 or the Alen BreatheSmart. Honeywell HPA300 is effective in a room of up to 465 sq ft. The ACH here is a powerful 5X and an amazing CADR of 320 Dust/300 Smoke/300 Pollen makes you believe that you won’t go wrong. This fan power is on par with even mid-range budget air purifiers. 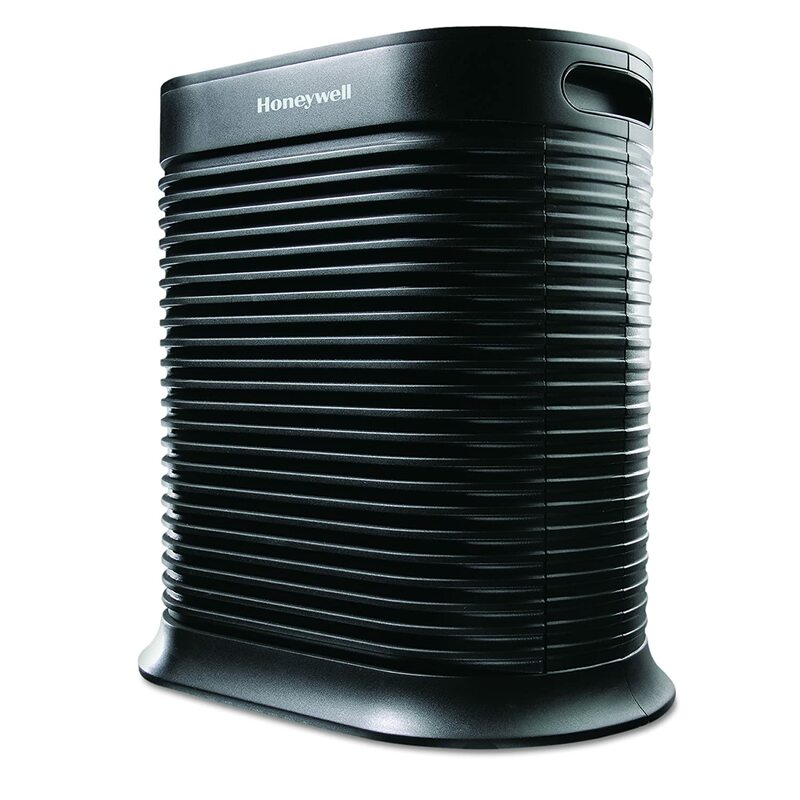 Honeywell HPA300 is effective for up to 465 sq ft.
Our only real quibble is the noise level of this air purifier. With the same budget, the Levoit LV-PUR131 is much quieter than Honeywell HPA300. Previously in our list: Coway AP-1512HH. 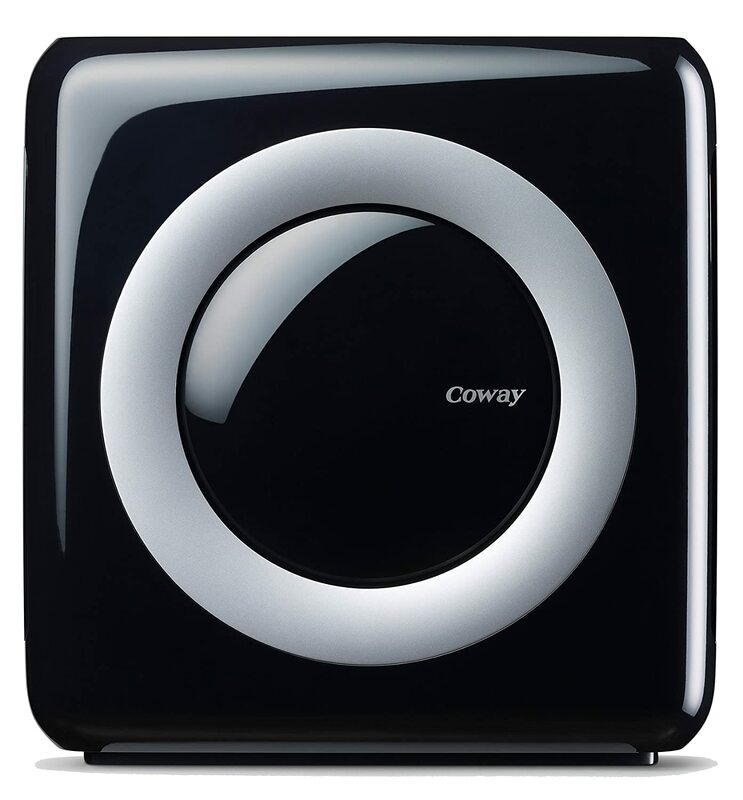 As the best budget device of the No.1 brand for air purifiers in Korea (the country of the giant Samsung), Coway AP-1512HH can win any conditions to be one of the best air purifiers for allergies and asthma in 2019. Actually, this device is nominated to be the Best Air Purifier not only from Breathe Quality, but also lots of well-known reviewers. Though many years have passed, it seems the Coway AP-1512HH is still the best budget air purifier you can buy right now. With the 4-stage air purification system, Coway AP-1512HH receives lots of positive reviews in Amazon, the Wire Cutter or many others. The performance rating of this air purifier is the same with the powerful Honeywell HPA300, and therefore, is a real deal to allergens and asthma triggers. Pre-filter – A washable pre-filter will help you capture the large particles of contaminants, from pet hair, human hair and mold. Activated Carbon Filter – This filter works its best to deodorize and trap harmful gas to keep your place fresh and odor-free. True HEPA filter – The high-performance composite True HEPA Filter that captures 99.97% of down to 0.3 microns allergens, virus particles, pollen, mold and fungi particles. Ionic Technology – Vital ionize can trap even the tiniest airborne particles and send it back to other filters. Can be switched on/off. First, we are checking the fantastic performance of this Coway AP-1512HH. To the core, its True HEPA filter has an exact same quality as the powerful Honeywell HPA300, that is able to capture 99.97% of any allergens, virus particles, pollen, mold and fungi particles as small as 0.3 microns. Aside from that, the ionizer is a vital part to increase the efficiency of this Coway AP-1512HH. It charges the ions to attract any contaminants to be trapped in the True HEPA filter. The combination is widely used in the high-end devices, like the Rabbit Air MinusA2. The Deodorization Filter, or Activated Carbon filter from Coway AP-1512HH, is also great. It can help eliminate the smaller particles to prolong the life time of the True HEPA filter, also it can absorb most of the chemicals, smoke, household odors and harmful gases. With such power, it is reasonable why the Coway AP-1512HH has won a lot of certificate and awards, including of the British Allergy Foundation Seal of Approval. Also, the sound is impressively quiet, if not the best for an air purifier. Moreover, thanks to the Eco Mode (Coway’s Smart Sensor), Coway AP-1512HH will always run at the low setting with virtually no sound. You can turn this air purifier all night to help keep your allergies and asthma away. With a great CADR rating of 246 Dust/ 233 Smoke/ 240 Pollen, this Coway AP-1512HH can cover up to 360 sq ft. Previously in our list: Levoit LV-PUR131. 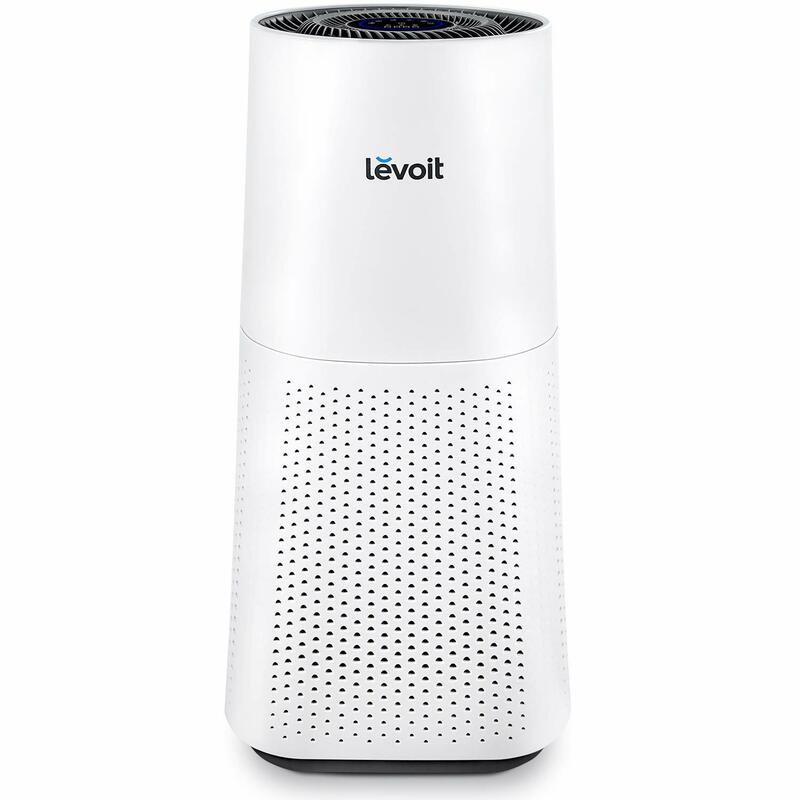 As the necessary upgrade to the last year Levoit LV-H133, the Levoit LV-H134 is everything this company needs to jump into the higher level in air purifier market. It won’t be a problem for this American brand, as they have managed to build an active community and loyal customers over just a few years. Levoit has improved the air filter since the release of LV-H133, and again, the Levoit LV-H134 will continue with an all-in-one air filter, which consists of 3 stages as below. Pre-filter – This nylon preliminary filter can capture airborne large objects like dust, pet dander, pet hair, lint and fiber. True HEPA filter – A True HEPA Filter can reduce 99.97% of down to 0.3 microns all contaminant particles like dust mites, allergens, pollen, and mold spores. Activated Carbon Filter – This Activated Carbon filter efficiently absorbs smoke, odor, formaldehyde, VOCs and benzene. We are once impressed by the high quality of Levoit’s True HEPA filter from the previous Amazon’s Best Seller – Levoit LV-H132. For two years, it seems this company has reached a whole new level with the new True HEPA filter of Levoit LV-H134. It is bigger, better performance and can last even longer than the predecessors. Also, the new filter media allows storing more activated carbon to enhance the performance against the smoke, odor and even formaldehyde or Volatile Organic Compounds (VOCs). The Smart Sensor is now a common feature in the Levoit LV-H134. You can get the real-time feedback of your indoor air quality almost instantly, thanks to the very accurate sensor. But the main thing that impresses us is the brand new fan power: the fact that the 2019 flagship Levoit LV-H134 fix every problem of the Levoit’s weak fan power with a high CADR rating of 312 cfm. You can see why this air purifier can even cover a room of 710 sq ft.
Related post: Best air purifiers for dust. Previously in our list: Philips 5000i. 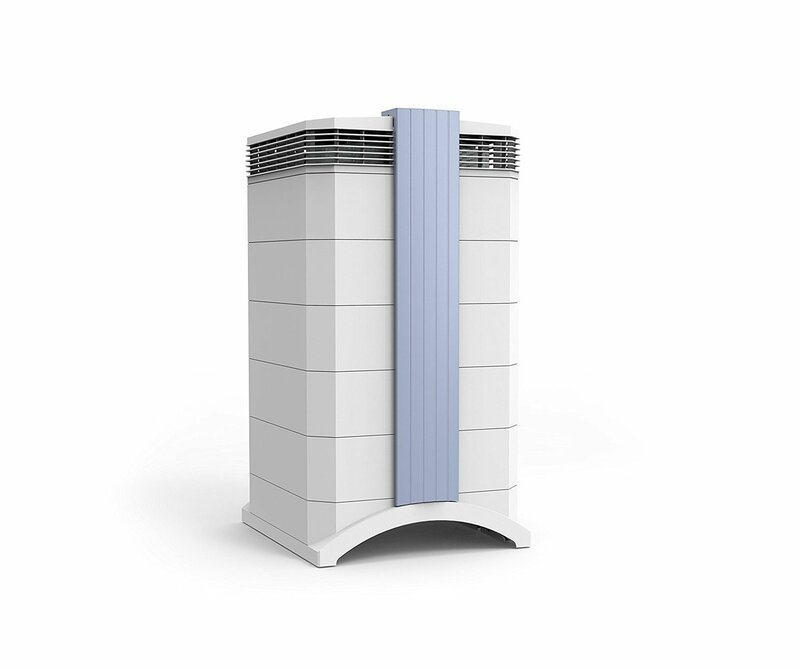 Blueair Classic 405 is a well-known air purifier in every region. It is recommended by both the Swedish Asthma and Allergy Association (which is under the European Academy of Allergy and Clinical Immunology) and Today’s Parent as the best air purifier for allergies and asthma symptoms. If you can pay up more, you can get the Blueair Classic 480i with the same specs and an additional Smart Sensor, but we believe that Sensor is unnecessary for those who just need complete allergies and asthma solution. Blueair is a symbol in the air purifier industry, as their air purifiers are available in no less than 50 countries. They are famous for making only one powerful air filter for their devices. In our Blueair Classic 405, you can choose between these air filters. Particle Filter/ SmokeStop Filter – You can choose from the Particle Filter with the power to capture 99.97% of pollutants such as pollen, dust, pet dander, mold spores, viruses and bacteria down to 0.1 microns. Otherwise, you can pay more for SmokeStop Filter, which has one additional layer of Activated Carbon Filter. The Particle filter of Blueair Classic 405 shares the same performance as any other True HEPA filter in the market. It combines both mechanical and electrostatic filtration to make sure even the 0.1 microns allergens will not escape the filter. Moreover, the gradient structure of Blueair Classic 405’s filter traps particles of all sizes while maintaining maximum airflow. It resists clogging and won’t re-release particles back into the air, even when the filter is heavily loaded. To combat against the gases and odors, Blueair Classic 405 uses a SmokeStop filter with highly porous structure made of activated carbon. We spent 3 months to test the air filter of Blueair Classic 405, and we can assure that it is naturally antibacterial. That being said, the air filter will prevent bacteria and mold growth, which are also the top factors to cause allergies and asthma. The technology of Blueair is called HEPASilent not without a reason. This Blueair Classic 405 operates in a silent mode that is even lower than the noise level of rustling leaves. As a high-end air purifier, Blueair Classic 405 can be controlled via Alexa. This feature works great, though for most of those who suffer from allergies and asthma, the Smart features are mostly ignored. Blueair Classic 405 has a powerful CADR rating of 300 Dust/ 280 Smoke/ 300 Pollen (cfm). With such power, this air purifier is capable of cleaning 430 sq ft with no difficulty. 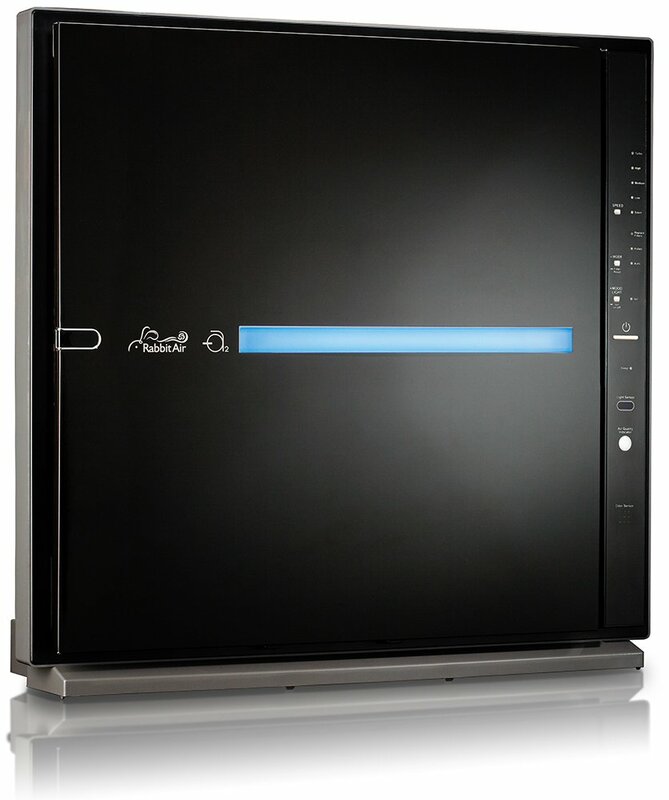 Review: Blueair Classic 405 Review. Related post: Best air purifiers for smoke. Previously in our list: Austin Air HealthMate Plus. If you have serious allergies and asthma, and only the Medical-grade air purifiers are what you need, you can’t miss the brand Austin Air. Since 1990, this brand is a pioneer in the air purifier industry for more than 15 years. In the U.S, they maintain as the largest air purifier manufacturing facility in the world, with everything is built in-house. The Austin Air HealthMate Plus is this company’s air purifier that can recreate the exact “hospital clean room” environment. Pre-filter – To remove any large objects of pollutant particles like pet hair, human hair or large dust. This pre-filter is washable and permanent. 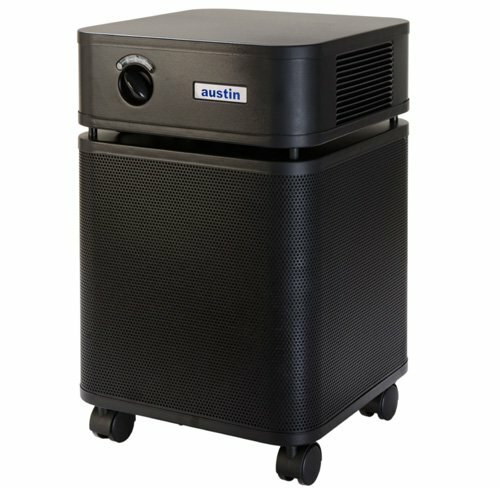 Medium Particle Pre-filter – Austin Air HealthMate Plus can remove molds, spores and pollen with this pre-filter. Activated Carbon filter – A 15 lbs of Activated Carbon, Potassium Iodide Impregnated Carbon and Zeolite to help remove VOCs, formaldehyde, benzenes, chemicals, gases and odors. True HEPA filter – With double the pre-filter, the True HEPA filter will only need to capture the tiniest particles. Using a Medical Grade 60-square-ft True HEPA filter, Austin Air Healthmate Plus is a real deal to any contaminant problems in your large room. Just like the Rabbit Air MinusA2, the Austin Air HealthMate Plus makes use of the double pre-filtration system. The Medium filter is alone a HEPA filter which grants enough protection against the small to medium size particles like spores or plant pollen. Thanks to these double pre-filter, the True HEPA filter will last longer, up to 5 years. You don’t believe it? Austin Air offers a 5-Year Pro-rated Filter Warranty, which is by far the most comprehensive in the air purifier industry. With a True HEPA filter media as large as 60 sq ft, Austin Air HealthMate Plus removes 99.97% of all particles larger than 0.3 microns and 95% of all particles larger than 0.1 microns with ease. Such performance is the real power of a Medical-grade True HEPA filter. Also, Austin Air HealthMate Plus has and Activated Carbon filter, filled with Potassium Iodide Impregnated Carbon and Zeolite, to remove Volatile Organic Compounds (VOCs), formaldehyde, benzenes, chemicals, gases and odors. Such unmatched performance is the reason why this Austin Air HealthMate Plus is selected by the U.S government to help protect the residents of Anniston, Alabama during the elimination of chemical weapons. In 2016, it is also widely used to save thousands of residents of Porter Ranch, California against the effects of the Southern California natural gas leak. This air purifier has a fantastic fan power to be capable for even the large rooms. With CADR rating of 400 cfm and 5X ACH, you can expect to use the Austin Air HealthMate Plus in a room of 1500 sq ft. However, please note that the Austin Air HealthMate Plus is a real machine which operates with high noise level. If you can’t stand the noise, you should choose other air purifiers in this list. Review: Austin Air HealthMate Plus Review. Previously in our list: Blueair Classic 605. With the improvement on the True HEPA filter, the Alen BreatheSmart 75i is now the best air purifier in entry-level of high-range for allergies and asthma. It is not just great with the high-quality air filter as well as good fan power, this air purifier is backed up by a strong Forever Warranty – which is the best customer service only offered by Alen. The Alen BreatheSmart 75i just only upgrade the True HEPA filter, while keeping the same 3-stage air cleaning system from the predecessors of this brand. Pre-filter – A washable pre-filter to help capture the large objects of pollutants like dust, pet hair and pollen. Pure – The standard True HEPA filter of Alen BreatheSmart 75i, which is able to capture 99.97% of as small as 0.3 microns pollutant particles such as dust, dust mites and pollen. Fresh – The next level HEPA filter will improve the first Pure, with an addition of Activated Carbon filter, to deal with the household odors and chemicals. This air filter is necessary for people who are sensitive to VOCs. Pet – Without the Activated Carbon filter, the Pet air filter uses the Alen’s patented Molecular Conversion Powder to ensure heavy pet odors are destroyed at a molecular level. Heavy Odor – Alen BreatheSmart 75i changed the Molecular Conversion Powder in the Pet air filter to make the new Heavy Odor filter, which can remove the household odors from smelly kids/teenagers, kitchen garbage, and other everyday activities. Ion Generator – The ionizer is used to improve the efficiency of this Alen BreatheSmart 75i. Can be switched on/off. Overall, whichever True HEPA filter you are using, the Alen BreatheSmart 75i is capable of removing 99.97% of as small as 0.3 microns pollutant particles. If you have asthma triggered by the strong odors, you should use the Pet or Heavy Odor filter. Undeniable, the Alen BreatheSmart 75i operates quietly as the noise level is only 25 db, just the same as the Rabbit Air MinusA2. It is even quieter than the noise level of the whisper, and you barely can hear a sound from this device. Moreover, the Alen BreatheSmart 75i can generate soothing pink noise – a frequency proven to help you sleep 25% better. This air purifier can cover a room of 1300 sq ft, with CADR rating of 347 cfm. With better fan power, the Alen BreatheSmart 75i can clean a room faster than our today champion – the Rabbit Air MinusA2. Finally, we have a great Smart Sensor for this Alen BreatheSmart 75i. With many tests, it is safe to say that its sensor is the most accurate and fastest in the market. It will always let you know the status of the air quality around you, and change the fan speed automatically to suit it. This is the most reason why this Alen BreatheSmart 75i can defeat the Blueair Classic 605, which doesn’t include an air sensor inside. Review: Alen BreatheSmart 75i Review. Previously in our list: IQAir HealthPro Plus. Yet another Medical-grade certificate air purifier in our list of best air purifiers for allergies and asthma. IQAir is truly a monument for everything about air cleaning innovation and expertise, with more than 50 years of experience. It is safe to say that with the IQAir HealthPro Plus, you can say goodbye to allergies and asthma forever (of course just in your house, and only for airborne allergies). We expect no less than a top-notch 3-stage air filtration system from this IQAir HealthPro Plus. This proves to be the most reliable technology in the world to help filter all these contaminants out and make fresh home air quality better. Pre-filter – The Micro-particle filtration is the the preliminary elimination to even the micro-particles such as pollen, pet dander, and mold spores after air is drawn in through the air intake. V5-Cell Gas & Odor filter – Next, you will experience the powerful V5-Cell Gas & Odor filter (exclusively for IQAir air purifiers). With both high quality granular activated carbon adsorption and pelletized chemisorption, this filter will destroy any harmful VOCs and chemicals. Moreover, the average filter life is about 2 years, effectively reduce the cost of filter replacement. True HEPA Filter – IQAir uses an unmatched HyperHEPA filter which can capture 99.97% of down to 0.3 microns particles and even 95% of particles down to 0.003 microns. There should be no more quarrel for the world class performance rating of IQAir air purifiers, especially by the flagship IQAir HealthPro Plus. This air purifier advances the latest powerful HyperHEPA filter H13, which is better than the powerful filter H11 from IQAir GC MultiGas. It represents something that most air purifier users want: a perfect fresh air purification. You know already that this is an expensive air purifier, but IQAir has done all it can to justify that cost. Even the pre-filter is able to capture 55% of as small as 0.3 microns particles. It will help improve the efficiency of the next HyperHEPA filter, which is a non-woven glass microfiber, non-offgasing separators True HEPA filter with high efficiency to even the tiniest ultra-fine particles. Most importantly, the average filter life of this True HEPA filter is approximately 4 years, which is undeniable the best HEPA technology up until now in the world. Now you must know why the Swiss brand dares to claim “#1 Rated room air purifier for allergies & asthma” for their IQAir HealthPro Plus. Their V5-Cell is also a good solution to deal with any kinds of chemicals, smoke and odors. With an impressive CADR rating of 300 cfm and up to 776 cfm, the IQAir HealthPro Plus is a beast for an area of 1125 sq ft.
We should skip the introduction of this air purifier’s Smart Sensor. As you can see, beside from the cost, we can’t find anything bad from the IQAir HealthPro Plus, an ultimate solution for any allergies and asthma problems. Review: IQAir HealthPro Plus Review. If you have trouble with smoke, or if the top reason for your asthma trigger is anything related to smoke and odors, you should use the IQAir GC MultiGas instead. The HyperHEPA filter from this air purifier is inferior to IQAir HealthPro Plus, but it is powerful enough to be better than any other True HEPA filters. The bottom line is the unchallenged top-notch performance of its Cartridge-based Activated Carbon filter. The highest quality ABS plastics of this filter can remove any harmful chemicals, formaldehyde, smoke, odors and Volatile Organic Compounds (VOCs). Previously in our list: Oransi Erik 650A. Oransi EJ120 is the newer, smaller version of the flagship Oransi Erik 650A. While it is smaller, it reduces the cost to half of the predecessor, but only with a near same fan power and equal performance. If you are a fan of this “Made in USA” brand, this air purifier is the best air purifier you could get right now. Expert tips: EJ stands for Erik Junior. As the last candidate in our list of best air purifiers for allergies and asthma, Oransi EJ120 is extraordinary with the typical 2-stage air cleaning system from this brand. Pre-filter – A 1-inch deep pleated Activated Carbon filter is acted as a pre-filter. It is effective for removing the smoke, household odor, chemical and VOCs. You can buy another pre-filter to help the Activated Carbon filter, especially when you live in a high dust environment. True HEPA Filter – A 3-inch deep main HEPA filter which can remove 99.97% of all particles as small as 0.3 microns. Because the carbon is not effective in long term when using in humid environments, Oransi has developed their Activated Carbon filter with a proprietary gas filter media. As a result, the Oransi EJ120 is truly effective for removing gases and smoke, including of methane gas, sulfur gases, and many others. This Activated Carbon filter is perfect to deal with many toxic chemicals like formaldehyde, sulfur dioxide, and nitrogen dioxide. Oransi EJ120 also uses the Medical-grade True HEPA filter (MERV 17), which is as large as 36 sq ft. Though it isn’t as large as the Austin Air HealthMate Plus, it is exactly the same industrial filter that is trusted by hospitals. For all kinds of allergies and asthma, the Oransi EJ120 is the perfect solution for you. This company truly has improved their German engineered EC motor to deliver a strong fan power while being quieter and using much less power. The noise level of this Oransi EJ120 is as low as 19 db, which is even quieter than the sound of rustling leaves. It is amazing, and you can’t expect other air purifier with such high performance to operate with less noise than the Oransi EJ120. And yes, the fan power is still great, with AHAM verified CADR rating of 333 Dust/ 331 Smoke/ 360 Pollen (cfm) and 5X ACH. Such power is enough for this air purifier to clean a room of up to 1500 sq ft.
An allergy is a sensitivity in your immune system. It is common and can’t be cured. The most common allergies are hay fever, allergic asthma, food allergies and allergies from airborne allergens. Airborne allergens can be dust, dust mites, pollen, mold, fungi spores, pet dander, pet hair, tobacco smoke and a numerous of other pollutants. These airborne particles range in size from 0.3 microns and larger. Loss of breath, dizziness, wheezing, and coughing are a few symptoms of an asthma attack and can be very dangerous for who suffer from asthma. Asthma is a common respiratory condition in adults and children that can be passed on genetically or developed throughout life. An asthma attack occurs when a sufferer’s airways to the lungs become narrowed and inflamed. The main triggers of an asthma attack include contaminant particles such as pollen and dust, as well as chemicals like paint fumes and tobacco smoke. Why air purifier is necessary for allergies and asthma? According to Asthma and Allergy Foundation of American (AAFA), more than 50 million Americans have experienced various types of allergies each year. And it can cause death, seriously! Also, the annual cost of allergies exceeds $18 billion. These numbers won’t lie, you can keep reading the allergy fact from AAFA’s website. Because you are in the allergies and asthma group, you must have researched for millions of methods to help you reduce, or even cure the allergies. Then you find out there is no cure. Only prevention. And one of the most advised method to prevent allergies and asthma today is finding the best air purifiers for allergies. Most of the causes of allergies and asthma are from airborne contaminant particles, which can be reduced ultimately with a best air purifier for allergies and asthma. Remember, the better you can remove the airborne pollutant particles, the better life you will have without allergies and asthma. Important Note: Allergies and asthma causes are varied, not just by airborne particles. So air purifier can not be a substitute to other necessary treatments. 1, Do air purifiers work for allergies? For the complete buying guide in 2019, you can read here. Pre-filter – An essential feature of air purifiers that use a HEPA style filter. The pre-filter captures the large dust and pet dander to help prolong the life time of the main filter. Most pre-filters are washable and reusable and last a lifetime. True HEPA Filter – This is the highest standard air filter you can get for a best air purifier. In order to carry this label, the filter must meet strict regulations set by the United States Department of Energy (DOE) and capture at least 99.97% of particles as small as 0.3 microns. A true HEPA filter needs to be replaced after 6 months to 1 year, and you should use the suitable replacement for your air purifiers. Activated Carbon (or Charcoal) Filter – This filter can absorb odorous particles and gases. That’s why it can remove the smells produced by smoke, pets, cooking, chemicals, etc. Ionic Filter (or Ionizer) – This filter emits negative ions to charge small particles like dust, pollen and bacteria and collect them into a plate. UV-C Light – The Ultra Violet light destroy bacteria and virus by sterilizing them. The UV-C Light (UV Light type C) is harmless to human. Advanced BioGS HEPA Filter – A technology from Rabbit Air, to help prolong the life of the main True HEPA filter. ACH – Stands for “Air Changes Per Hour”, tells you how many times the device can exchange the air within a room with clean, fresh air every hour. CADR – Stands for “Clean Air Delivery Rate”, tells exactly how well an air purifier can clean the air within a particular size room. We hope this list of best air purifiers for allergies and asthma is good for you. Hope you a healthy life. Thank you!